Most residential homes in the big cities and suburbs are no longer designed with sprawling lawns. Lack of space and exorbitant price of the land is forcing many to design an entire house for the smallest of plots in the city. So it is difficult to plan a generously sized garden on a tiny piece of land. However, you may still have greenery around your house. The following examples will show you how. Who wouldn’t love to sit down on a cosy nook like this and spend some time with oneself or one’s dearest ones? 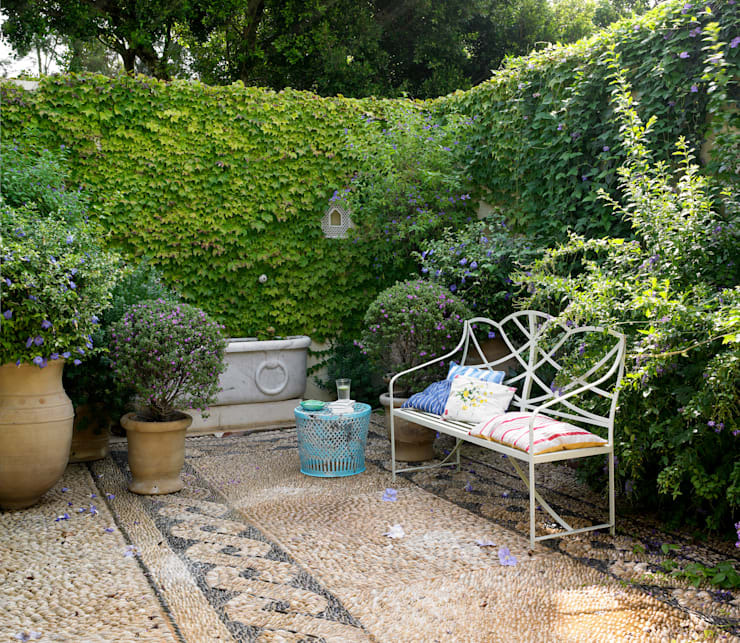 It is decorated in a Mediterranean style with a variety of fragrant plants, including lime tree. The orange colour of the wall that can be seen through various creeping plants add spice in the otherwise calm and cosy space. 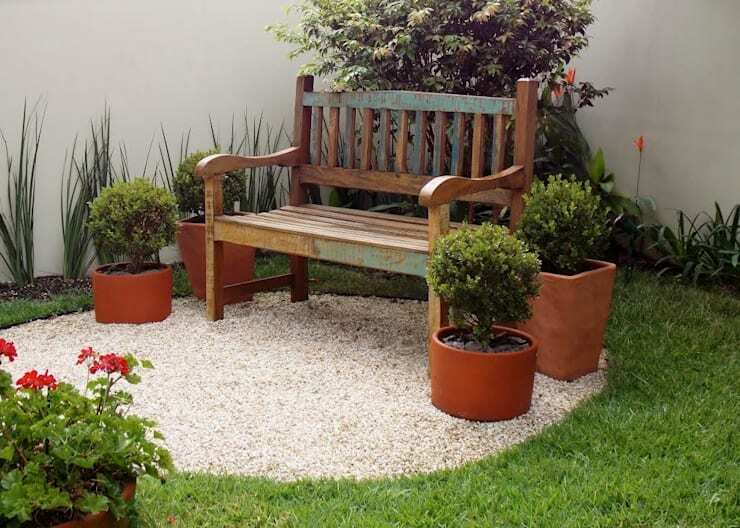 These creative garden design ideas will also help you in your endeavour. 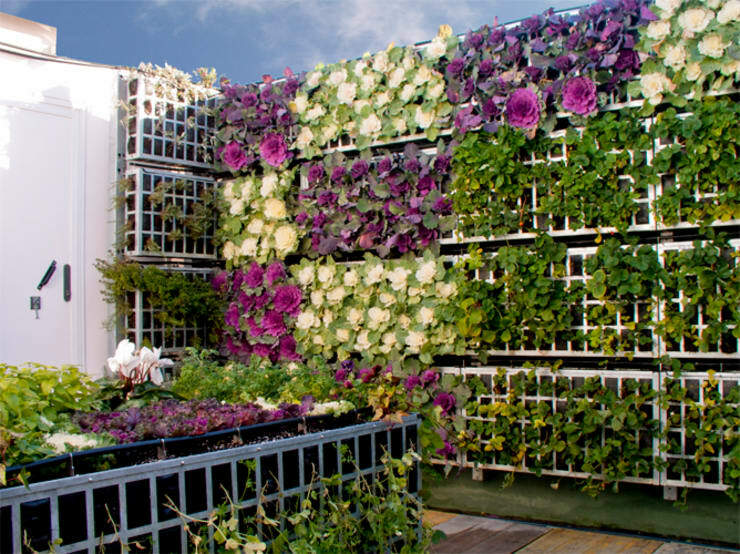 Vertical garden has come to the rescue of those who love gardening, but cannot indulge themselves due to a lack of space. You too can design beautiful vertical garden in your front yard, on the terrace or small garden at the back of your house. A variety of ferns, mint, petunia etc are some of the best plants for vertical gardens. Only have a narrow piece of land between your building and the boundary wall? You still can design a stunning garden. 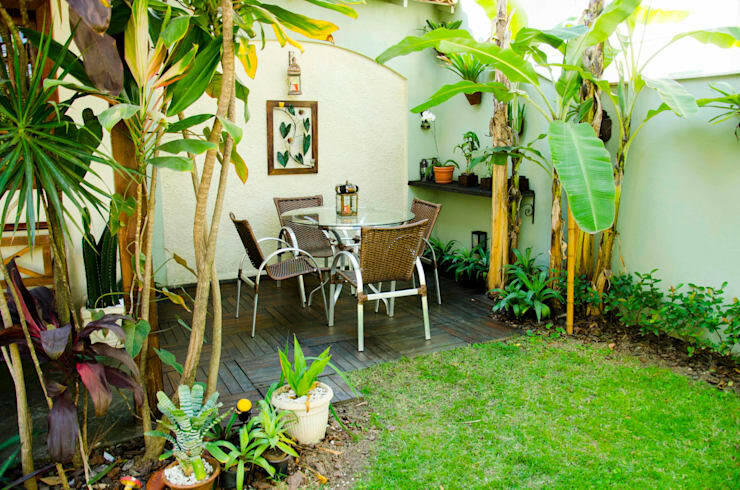 Take inspirations from this garden decorated with a variety of plant species. The ground is prepared with stone chips, boulder rocks and wooden garden path. 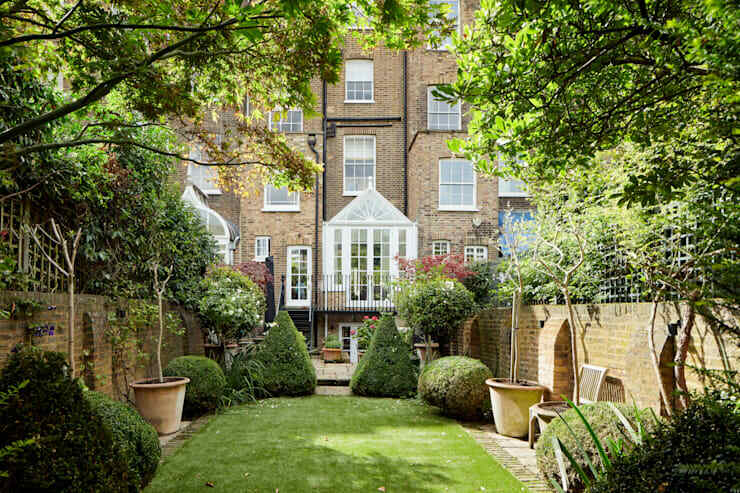 Do not hesitate to speak with an expert landscape designer to plan a beautiful garden in a tiny piece of land. Add a refreshing touch in the front yard of your house with some simple ingredients. Plant appropriate seasonal flowers and perennials in this space. Choose an appropriate space to set a small bench. You may recycle any one of your old benches. Install a stylish outdoor lighting fixture to illuminate the area. You can tuck this small garden on one side of the entryway of your home. 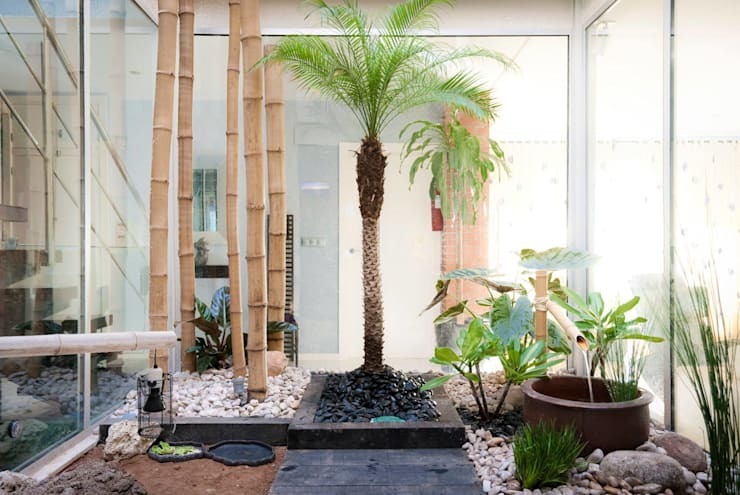 It is decorated in the style of a rock garden with a palm tree capturing the focal position of the tiny garden. A small bamboo fountain accentuates the Japanese feel of the garden. The owners of this house have made the maximum use of a tiny piece of land between two buildings. They have converted it into a space of outdoor relaxation. It is designed with a patio, seating area, swimming pool and deck. Vertical garden creates a beautiful background to it all. Take some time out to plan the flooring of your outdoor entertainment zone irrespective of its size. 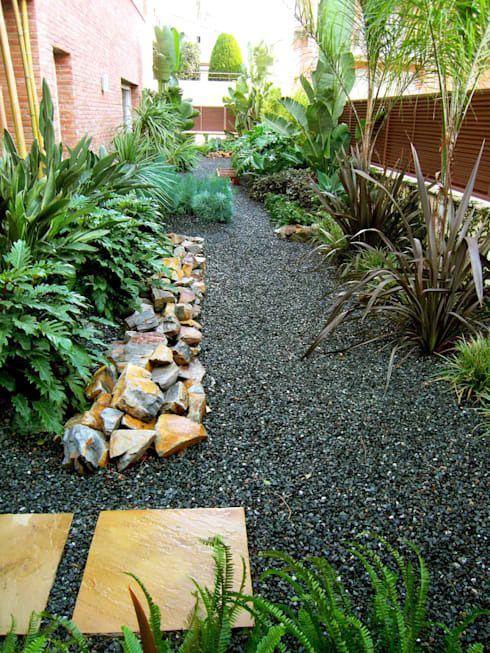 See how this river bed pebble studded flooring adds character to this otherwise small garden corner. Pebbles have used to create a mosaic. 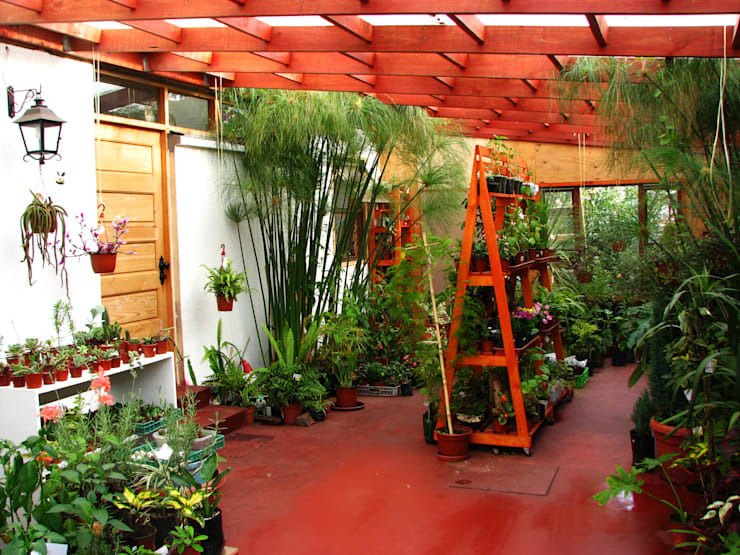 This space is also decorated with plenty of potted plants and vines. Thanks to a large collection of charming shrubs, cacti, orchid and assorted flowering plants, this space looks vibrant enough. The red flooring, wooden trellis and red terracotta planters make this tiny garden look just perfect for a fashionable city home. Not often would see an outdoor dining area decorated in such graceful fashion. It is stylised with wooden deck and simple outdoor furniture. Locally available plants and cacti have been used to inject beauty in the surrounding atmosphere. It is difficult to find such a patch of greenery as this one in a city. Imagine spending some time every morning in a lush green garden like this. Convert the backyard of your house into a sanctuary of peace, health and vigour like this family home. If you have kids at home, they too would love spending some time here appreciating the treasures of nature. Check out these spectacular pergola designs for the backyard of your home. 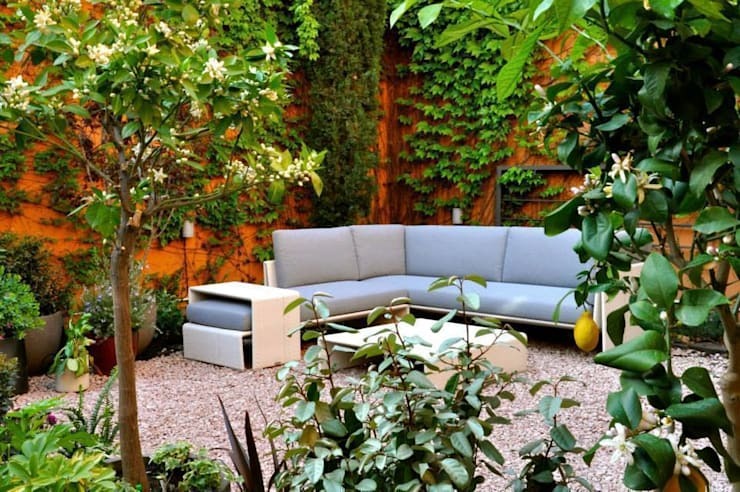 Which of these small garden design ideas interest you most?